modesty. I stay sort of ugly. I climb slowly to the top of the hill. I like working with that impossibility. and More magazine, October 2011. As I've mentioned before, I love Cut-Up Poems. When my writing feels stale and my thoughts routine, the cutting process invigorates. With a Cut-Up poem, you borrow words and phrases from other sources. With each extraction you create opportunities for words and ideas to jump and explore. With draft and draft, words are rearranged and rewritten so the final poem bears little resemble to your first clipped lines (eliminating the chance of plagiarism). 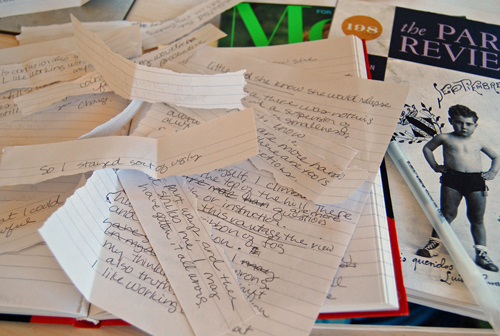 How to Make a Cut-Up Poem: Take a work-in-progress poem or journal entry and copy lines onto a clean sheet. Cut apart the lines with scissors. Now mix the lines and arrange in a new order. Throw in additional lines from assorted books or magazines. Play around, shift lines, discard some and add others to make your own poem. This process sometimes yields good poems. More often it breaks the routine and opens the door for the next good poem. Whether writing prompt or powerful new poem, it always feels good to exercise the writing muscle and produce new work. Try This: Cut-Up my Cut-Up Poem! I'd love to read what you create. Please share your Cut-Up Poem here.